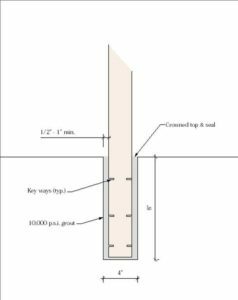 No matter if it’s your first time installing a fence or you’ve installed many, you are sure find some helpful information in this article to help you set fence posts with fast setting grout. 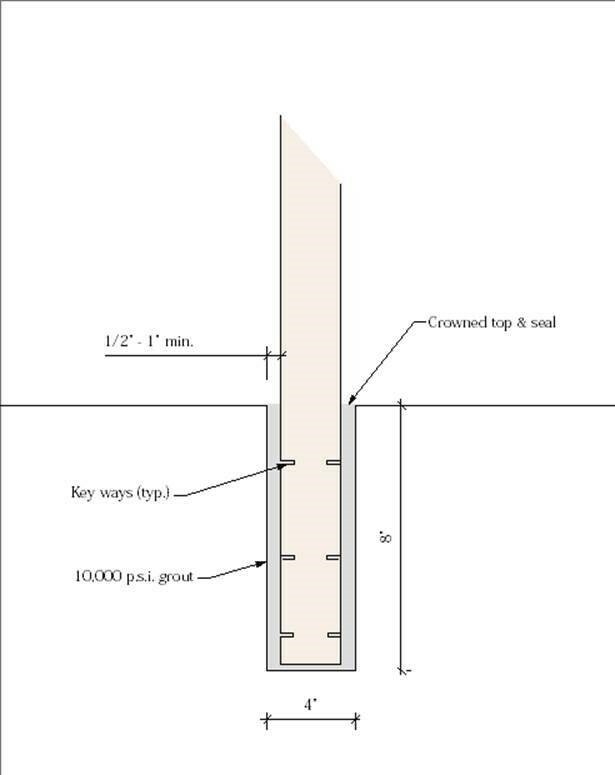 This “How To” guide will walk you through the process, step-by-step, to ensure the best application of fast setting grout for fence posts. Below is the Quik-Rok—a popular fast setting grout—mixing guide. If your posts are larger than 3 in., make sure the hole is at least 1 ½ to 2 in. larger than the post. If you’re using fast setting grout as an additive to concrete, make sure to use the 1:2:3 mix: Grout : Portland : Gravel. Use as little water as possible, while still using enough to establish flow. Too much water will break down the grout. Your holes should be 3x the diameter of your posts. A 3 in. post would require a 9 in. diameter hole. Add key ways into the post by cutting slits into the base. This will significantly increase the gripping strength of the grout to the post. The biggest challenge with fast setting grout is posts breaking free from the grout. Widen your gap between the post and the edge of the hole to allow materials to flow all around it. For a 2 ½ in. diameter post, you only need to drill to a depth of 7 ½ in. Leave at least a ½ in. void all around the post so that the grout may flow freely to fill it. For a 2 ½ in. post, use a 3 ½ in. rock drill bit or core drill. TIP: When mixing grout, cut the top of the pop bottle—or whatever container you are using to mix—at a 45-degree angle. This will allow you to tip the container and easily pour the grout in the gap. This is actually 1 ½ in. deeper than what is required by the Federal Specification RRF-191 which requires a depth of 6 in. Bear in mind that we are tying into the slab. Doing so, the post will only fail if the slab fails. No further footing is required. In accordance with ASTM 567 and general practice, it is not necessary to keep drilling. Only a few more inches and we will hit the bottom. It should be measured by depth along with diameter. 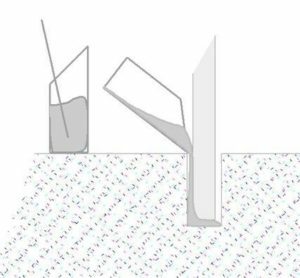 When installing a project that includes drilling, you must consider the depth of the material that you will be coring or drilling. 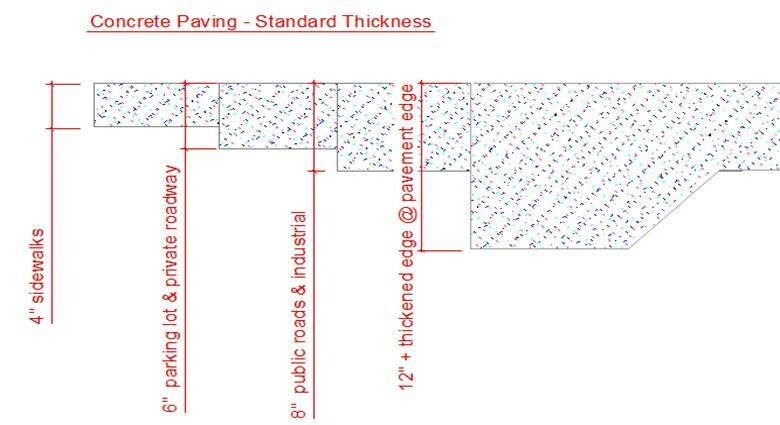 The below illustration demonstrates standard thickness of paving based on use. This is a good rule of thumb. However, this does not apply to asphalt. Most asphalt slabs are less than 6 in., but it may vary considerably as additional lifts are placed over time. 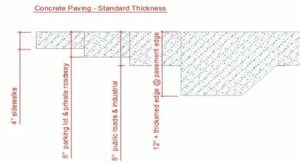 It is not unusual to find asphalt slabs over 12 in. thick.